This year has represented a turning point for electric vehicle adoption, with sales in key regions increasing significantly, Jato Dynamics says. China is by far the country with the most electric vehicles on its roads, accounting for some 227,000 sold between January-September this year. The country is followed by the USA with 61,000 and Norway with 24,000. China is seen as a key component of global EV adoption, Jato says, with the Government introducing policies to push forward EV sales, particularly for domestically produced vehicles. Furthermore, the country’s Carbon Credit Program that comes into effect in 2019 favours electric vehicles over plug-in hybrids, which is beneficial for global manufacturers wishing to enter the Chinese market. The country is now not only the largest EV market in terms of volume, but also seen as a hotbed for development of the new technology. As a result, six of the top ten electric vehicle brands in key automotive markets through September 2017 are based in China, Jato adds. In contrast, the USA’s EV market has slowed down after a peak in 2016, which Jato says could be caused by a legacy of cheap oil and a consumer preference for petrol engines and isn’t helped by the current administration’s stance on electric vehicles. This isn’t helped by geographical factors, as the US market is more spread across the country and range anxiety of existing EV models is still seen as a problem. A modest increase of 21% EV sales in the USA compares to the European market where sales have increased 42%, when compared to the same Jan-Sep period in 2016. However, despite growth in the sector, market share remains small in most European countries with France 1.2%, Germany 0.6% and the UK 0.5%. Norway leads the world with a market share of 16.6%, which compares to the next highest, the Netherlands, with just 1.4%. 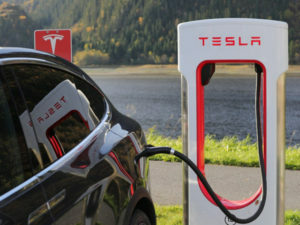 Norway is a unique market amongst others due to its pre-existing network of electric plug-in points that were previously used for electric heaters within cars while parked at, for example, a shopping centre. This existing network and mind-set has proven to make adoption of electric vehicles more simple, along with subsidies and incentives that encouraged up-take. Jato Dynamics supposes that the boom in electric vehicles sales is due to governments’ search for air-pollution solutions and increased pressure on carmakers to reduce overall fleet emissions. The result is the vast majority of car brands have placed various forms of electric vehicles at the heart of their future plans. Following this and subsequent public exposure, consumers are increasingly aware of their existence on the market. Felipe Munoz, Global Automotive Analyst at Jato Dynamics, said, “Regulations to penalise emissions are beginning to impact countries, and consumers are increasingly abandoning diesel vehicles following reputational issues and proposed bans. “As a result, car manufacturers are prioritising the development of electric vehicles. The decline in diesel sales is a significant opportunity for electric cars to fill this gap. “However, there are two key issues. Firstly, ranges in the segment are still limited, particularly in Europe, so consumer choice is not at the level needed for mass adoption. Secondly, consumer fears around driving range and performance still persist.